Wakelyns Population at the UK Grain Lab conference. supply chain at the UK Grain Lab conference. Using indicators such as protein content to assess quality in grain has become embedded in wheat production, and yet these indices are limited in what they can tell us about a wide variety of baking or organoleptic qualities. The diversity within OWP challenges us to explore alternative approaches to marketing of both the seed and grain. 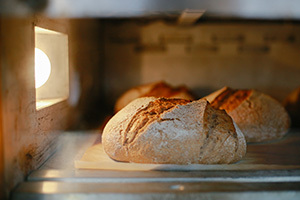 When it comes to the grain, Kimberley Bell of the Small Food Bakery has been pioneering the use of OWP, which has been nicknamed ‘YQ’ (Yield/Quality), in wholegrain bread and other baked goods and showing what is possible with wheats that may not comply with standard ‘quality’ measures. Alliances are now developing across the country to bring together bakers, millers, farmers and more who are looking for alternatives across the grain economy. 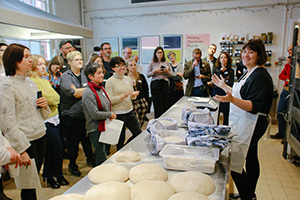 This was explored at the UK Grain Lab conference held at the Small Food Bakery in November 2017. In this article, Kimberley Bell discusses working with OWP, the current state of play and approaches to alternative systems with Charlotte Bickler. CB: It is clear that the appeal of OWP goes beyond certain traits and characteristics that it may possess. What drew you to OWP ‘YQ’? KB: At first it was the flavour, delicate and nutty/malty… and it might sound silly, but the silky texture of the dough we made with this flour was so enjoyable. Upon further investigation it was my interest in the story of Martin (Wolfe)’s work and ideas that compelled me to want to make a bread with it. I think to some extent many of us (bakers) are trying to find a way to work and exist in the world that contributes in a positive way to our community and environment. It just made total sense to me that we should be trying to bake with grain from Wakelyns and to play a part in getting this new grain into the food chain somehow, and the ideas behind it into the wider discussion on the future of food. Part of my interest in the YQ Wakelyns population was that (although a modern crop), Martin’s intentions in developing the crop seemed to be aligned with a (pre-chemical agriculture) set of values more reminiscent of the past. Looking to bring back biodiversity and farm in a low input system are certainly value sets that I believe those working with heritage varieties have in common with Martin’s work and the story of the population wheat. CB: We hope to test the baking quality of grain produced in our Organic Winter Wheat variety trial network, what would you be looking for when working with flour samples from these grains? KB: Flavour. As a baker working with naturally fermented dough, I’m interested in how that flavour manifests itself after fermentation. After that, it’s the baker’s responsibility to find an appropriate product to utilise good flour. Some benchmark measures would be helpful though for bakers, as not having them can be a barrier to investing in new flours. I have worked with two harvests of OWP YQ, milled by different millers and there have been big differences in the character (flavour and behaviour) of the resulting flour. This has as much to do with infrastructure as farming (storage and milling) but has been an interesting journey for me, learning how to cope with it, and testing my sense of responsibility as a baker to continue being an ambassador for this crop. CB: Do you think heritage is important? How do you define this? KB: I don’t have much experience of baking with heritage grain (though I would love to explore this). I would define them as older varieties that have evolved through hundreds of years of co-evolution and agricultural development. The work being done around the world to preserve them and bring them back into the food system is fascinating, and I think heroic. Though I have very little understanding of the science, I could certainly subscribe to the logic that crops that have worked well for our ancestors should be valued and certainly not allowed to be cast aside. CB: What does local mean to you? KB: Local means human scale and direct. It’s not about a prescribed geographic area, more about a web of strong human relationships that can deliver a sense of community and sovereignty over our food systems. For our bakery, in terms of geographical proximity, it’s about deciding what’s appropriate on a crop by crop basis. It makes sense for me that eggs should come from a few miles down the road, but, provided a relationship can be built and maintained with a farmer, I’d be happy to consider grain to be local from anywhere in the UK. CB: Do you feel that there are easy ways for the food system to incorporate these principles presently? Only after that mind shift (can) the principle of local, and the aim of sovereignty become achievable. Its time for all of us to realise that WE are the food system, it can be whatever we want it to be but we must become active citizens within it if we want it to deliver good, healthy food. So yes, in practise its easy! But in theory, lots of people can't, or are too exhausted to get their heads around it. How on earth did we get to a stage where a farmer will grow a crop that they don’t actually eat or haven’t even tasted. How on earth did we get to the stage where imported bananas or oranges are a cheap staple cheap food but locally grown salad is a luxury? There are of course barriers to building the localised infrastructure needed to support such a movement towards local, and we must also collaborate to break these barriers down. I could go on and on about this.. but the fundamental change needs to be an attitude shift in individuals away from the sanitised corporate brainwashing of the big food retailers and towards cherishing (enjoying, valuing and making time for) strong human connections within their own community. CB: What do you think the key elements of a successful local network are? What tips would you give growers and producers hoping to engage in something like this? KB: Fundamentally, people need to make the time and space to come together and form relationships that will provide the network. It’s critical that we work together, so, for cereal farmers wanting to trade more directly and build a community around their product, they need to get out there and meet bakers and millers. It won’t take long before they find people they can work with and this will give momentum to new ideas. Making time to step outside of your work and see what others in the network are doing is essential to building these relationships. 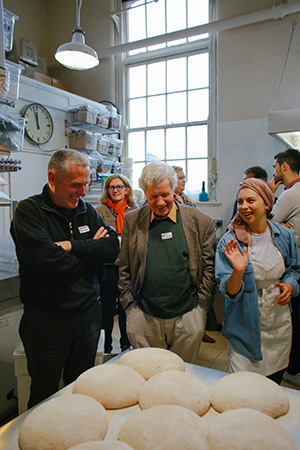 At Small Food Bakery the whole team spend up to two weeks a year travelling to visit farmers and suppliers and to attend lectures and conferences. Our network wouldn’t exist without this. But it works both ways, and it’s also important that our farmers and millers come to visit us too. It might sound like a luxury, but it’s during these visits that new ideas present themselves, problems get ironed out and business is done. They also build trust, loyalty and friendship… These are the most important elements of a successful ‘local’ network. 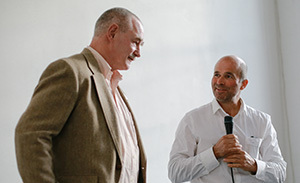 CB: What led you to organise the Grain Lab conference at Small Food last year? Will this continue? KB: I think we urgently need to build localised grain economies across the UK and I thought an event of this nature might help. I have had the privilege to meet some brilliant people working with grain at all stages of the network and it seems that there are many of us that share a common aim to build strong local networks, but we are disconnected and therefore don’t move forward. After hearing discussions amongst colleagues from the scientific and agricultural side talk about the obstacles they perceived to achieving this, and on the flip side, bakers speaking about the challenges they face… It just seems to me that the first step is to get everyone in the same room learning about each other’s work, sharing a meal together, cross-pollinating our ideas, building empathy and knowledge in a convivial atmosphere. I was inspired by the US Grain Gathering hosted annually by Steve Jones and the team at WSU Bread Lab. Each year they bring together a gathering of farmers, millers, bakers and scientists who spend 4 days eating, learning, teaching and spending time together. I guess I wanted to re-create this kind of learning and development opportunity here in the UK. CB: Where do you hope that the movement will go next? What role will the UK Grain Lab play in facilitating your vision? KB: I hope that we will see more farmers, millers and bakers working together in much more long term forward looking collaborations. Ideally with academics and scientists in the mix to support with their knowledge and resources. I feel that the UK is really lagging behind other countries in this and we should run to catch up. The UK Grain Lab (bolstered by our Grain Lab conference, which will be held again at the Small Food Bakery in November this year) will hopefully become a facilitated network that can help kickstart some of these relationships, foster a culture of transparency/sharing of knowledge and help to address some of the infrastructure problems we have to overcome. It would be great to connect seed breeders and those reviving old seed with bakers to ensure meaningful and real feedback loops – rather than relying on basic lab results and supposition to determine how to take things forward.